Let's face it, you can't do much but web browse without a mouse. Also, your lap and laptop really does get hot. LapLite is designed to increase productivity and reduce computer heat emission. Space between your legs and laptop reduce heat on both sides and often results in prolonged computer life. LapLite also increases overall stability by providing a beautiful platform on which you can work, game, or browse. What is the press saying about LapLite? "I like to sit on the couch with my MacBook Pro and do some work while also watching TV. I could do a LOT more work faster and easier with a lap desk like this one. The LapLite can accommodate up to a 17″ laptop and has some extra features that other lap desks lack like an aluminum mouse pad and a slot for your phone. The desk also has holes that provide ventilation to keep the laptop and your lap cool." "The light color of the bamboo combined with the industrial aluminum of the mouse pad makes it look less like a lap desk and more like a piece of art. With this kind of price point, along with the quality and sustainability, the LapLite is a must-have for anyone who needs a more mobile workspace in their home." Built on need, focused on design, and determined to be unlike the rest. You'll never want to use your laptop without LapLite again. ✔THE PERFECT SIZE: Designed to hold a 13"-17" laptop, an iPhone or similar cell phone or an iPad mini or similar tablet, and a mouse of your choosing while weighing less than 3 lbs. ✔A 21ST CENTURY ACCESSORY: Vented bamboo tray keeps you and your laptop cool while you game the night away, easy clean aluminum mouse pad provides a balanced blend of glide and control, and a built in tablet/phone dock with charging port plus multiple angled holes for snaking cords. ✔DESIGNED FOR THE ON-THE-GO WARRIOR: LapLite is designed to provide a cool laptop experience while enabling maximum freedom of movement. Also can be used as a beautiful home desk station. 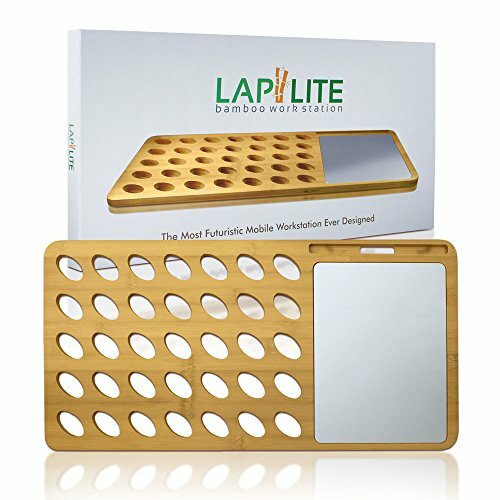 ✔REAL BAMBOO, REAL QUALITY: Made of the highest grade bamboo the market, LapLite will last for life. Eco-friendly bamboo is also one of the most sustainable woods on the face of the planet. ✔OUR PLEDGE TO YOU: The last lap desk you'll ever need. LapLite is backed by a 100% Money Back Guarantee. If you're not happy, neither are we! If you have any questions about this product by LapLite, contact us by completing and submitting the form below. If you are looking for a specif part number, please include it with your message.